Provide comfort for the family of Luis Gonzalez with a meaningful gesture of sympathy. 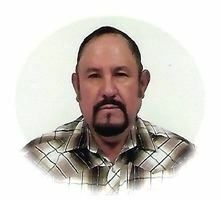 Luis Gonzalez, Sr. 70, died Friday February 8, 2019 at St. Catherine Hospital in Garden City, Kansas. He was born October 22, 1948 in Chihuahua, Mexico the son of Ramiro Gonzalez Fierro and Amalia Portillo. Mr Gonzalez was born and raised in Mexico. He moved to Garden City in 1982 and worked for Tyson in the processing department for 28 years. His wife Bernardina will remember him as a good provider, gentle friend and loving husband, father and grandfather. He was a member of St. Mary Catholic Church and Cursillista. His hobbies included grilling, although he couldn’t turn on the grill and watching action films, on every television in the house at the same time. Even though he fought various illnesses throughout his life, he never complained. He always had something to be grateful for, usually his friends and family. He was preceded in death by his parents and siblings- Hortencia, and Maria Gonzalez. Rosary will be held 7:00 pm Monday February 11, 2019 at St. Mary Catholic Church. A Funeral Mass will be held 10:30 am Tuesday February 12, 2019 also at St. Mary Catholic Church with Father Juan Salas as Celebrant. Burial will follow at Valley View Cemetery. Friends may call from 12:00- 8:00 pm Sunday February 10, 2019 and Monday February 11, 2019 from 9:00 am to 5:00 pm at Garnand Funeral Home in Garden City. Family suggests memorials to the Luis Gonzalez Memorial Fund. To plant a memorial tree in honor of Luis Gonzalez, please visit our Heartfelt Sympathies Store.